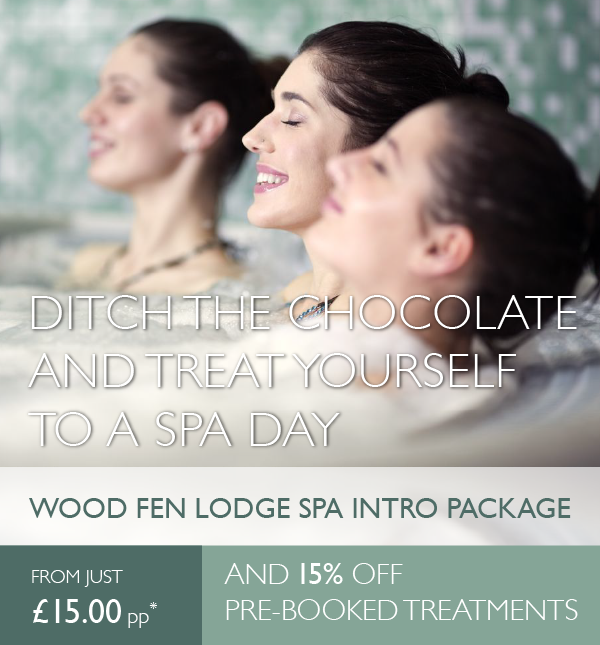 If you need a break from the chocolate, but would still like to give yourself a treat this Easter – then we highly recommend you spend a day with us enjoying our wonderful infrared sauna, hot tub and steam room which is included as part of our “Intro Spa Day” package. Whether you’ve experienced a Spa day before, or not, this package is simply wonderful and a great price – starting from just £15pp – you can even bring some of your friends to enjoy the experience with you. While you are with us, make your Spa day even better by adding a treatment from our wide range of massages and therapies, and as long as you pre-book your treatment we will take 15% off that price too! This offer is available until April 30th 2019. Although you need to book your Intro Spa Day Package before the end of April, you can take up to 6 months to use it. Contact Yvonne or Lucy on 01353 862495. *A starter and/or dessert can be added to your one course healthy lunch – for £3.95pp each extra course. ** Excluding our “Treatment of the Month” back massage which is already reduced to £20 (normally £30). Pre-book a treatment from our wide range of massages and therapies – and we will give you 15% off! Alternatively, you can also choose to book a wonderfully relaxing back massage as a stand alone treatment at the special price of just £20pp (usual price £30pp). Do I have to use the Spa Day Package in April? To qualify for this offer bookings need to be made before April 30th 2019. But your actual visit can be any time in the next 6 months. Can I book my Spa Day Package for any day I want? Yes! We are now open 5 days a week. Tuesday to Friday, and Saturday. You can book your package on any of these days, but please note the different rate for a Saturday. Do you offer any other Packages me and my friends might like? Can I tell my friends? Yes, please do. If you know someone who would enjoy this special offer please forward the email on to them. Wonderful day, thank you! Lovely facilities and great staff! Thank you. “I have just returned from spending a weekend at Wood Fen Lodge. Family and friends had gathered there to celebrate my daughters imminent wedding…. Fabulous place, so relaxing and peaceful. Very welcoming. Definitely coming back. Lovely facial, good food. Very relaxing. Excellent. I went for an overnight stay with my husband. Very relaxing, home like and friendly. The food is lovely and the atmosphere is welcoming…. Lovely afternoon – Thank you! Another fantastic relaxing day. Thank you. Lovely relaxing day! Thank you! Fantastic day, good food, friend and welcoming. Will be back. Relaxing, great food, lovely place to catch up with friends. Amazing treatment. Amazing, relaxing place. Food excellent. Perfect place to unwind without children! Lovely relaxing place. Good lunch. Thank you. Great day. Very calming and relaxing. Thank you. Great way to end my holiday!